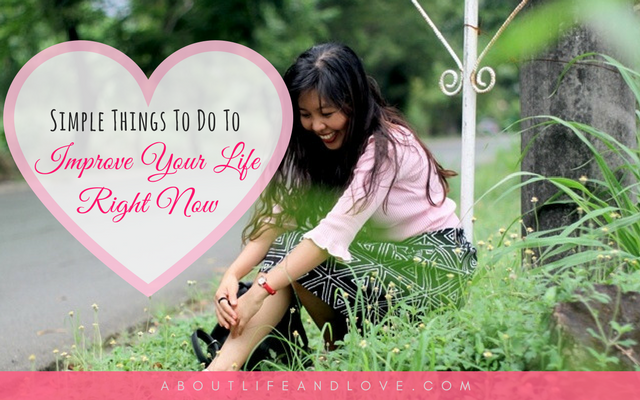 You may have written down the things you need to leave in the past for a lighter life journey (like I did). But how about things you need to do and bring with you? Here's a list of some simple things to do to improve your life right now. Bring gratitude with you. I've always been a believer of the power of gratitude. It makes you a blessing magnet. Gratitude fills your heart with joy and makes you ready to receive more. It is a product of abundance mentality and changes it your perspective on life. Bring your openness to learning and willingness to be taught. If you believe you know everything then you stop growing. Be humble enough to know that you need other people to teach you, that each person you meet has a lesson for you to learn, that you don't know everything. Because seriously, you don't. Be an eternal student. Learn from your mistakes, learn from other people's stories and examples, learn from the expert, learn from children, learn from animals, learn from the past. Use what you have learned in making better decisions, in improving your skills and thus increasing your career value, in avoiding detours by hanging out with the wrong people and being in the wrong situations, and in speeding up your way to a better life. Bring your humor and optimism. Author Elbert Hubbard said it best, "Don't take life too seriously. You'll never get out of it alive." Cut yourself some slack. Don't be too hard on yourself (a lesson I needed to learn). Learn to laugh at yourself and your boo boos. Nobody's perfect anyway. Everyone has tripped and slipped---alone or in front of a crowd. I have. Everyone has had a fashion flop history (except maybe for some like Selena Gomez and Audrey Hepburn who can't go wrong with fashion). Everyone has a flaw. You may not be perfect but you are made exactly as God intended you to be. Always look at the bright side. Never lose your sense of wonder. Bring your faith and trust. You may not see where your path takes you. You may be struggling for so long, trying so hard, working double and you are tired and discouraged because it seems nothing is happening. Your life feels like running on a treadmill. You're exhausted but you're still stuck. But you look around and everyone around you seems to be moving forward. Like in a marathon. I know that feeling so much. Things will not always go your way but it always works for the best. Trust the process. Trust God's plans no matter how difficult it may seem. Bring your value wherever you go. Remember who you are. Never shortchange yourself. In short, don't allow other people to treat you like crap. It's not about arrogance. It's staying true to who you are. It's about self-respect and self-love. It's about knowing you are meant to live an abundant life. Are you ready to improve your life right now? It's not that complicated. As for me, I'll be bringing a pocketful of sunshine, a heart full of hope and gratitude, and an expectant mindset. I'll also be bringing my water-resistant elegant black Zaful satchel perfect for anywhere, and my red Roman numerals Quartz watch to remind me that every minute spent on earth is precious. Simple fashion for a look that never goes out of style. What are you doing and bringing to improve your life? These are all really good ideas and things to try and do to improve life. I'm all for gratitude and optimism. I think those two are really important. Also, I loving all the happy photos here! I agree with all the things that you said here. I do hope that I do at least one of these for a better 2018. Great advice. Being trusting is one I find particularly challenging, but it's essential.